Dorothea Tanning is the third artist I discovered in this paper-doll of a writing project I took on back in the early 2000s. 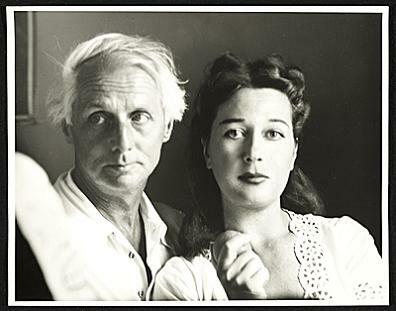 Just as I discovered Leonora Carrington’s art via her fiction, and then Remedios varo via a biography of Carrington, I found Dorothea Tanning by way of her relationship with Carrington’s former lover, the famous surrealist Max Ernst, who left his wife Peggy Guggenheim for Tanning. They married in a double wedding with the surrealist Man Ray and his wife Juliet Browner. What circles these people moved in, I swear! If ever I had a Midnight in Paris time travel adventure, I think I’d want to go back to the Paris that these painters inhabited, and of course geek out from the periphery of their lives. One day time travel tourism will totally be a huge industry! Like Carrington, Tanning practiced multiple art forms: painting, sculpture, set building for theater and the ballet (she even built a set and costumes for one of George Balanchine’s ballets, The Night Shadow), and she wrote poetry and fiction and memoir. I’m completely baffled by this triple-threat type of person, and completely humbled. I’ve written both novels and short stories, essays and some occasional poetry, but I wouldn’t know where to begin with visual design. I just don’t have the skills, even if I have the desire to make visual art at times. Tanning was the last in this triptych of artists whose work held me so intensely that I felt compelled to write stories from the experience. And because I was working with images of the female body within a surrealist art context, it felt incredibly appropriate to end the collection with the story, “Birthday,” which was inspired by Tanning’s painting of the same name. Here was the final image I wanted the collection to end on, a self-portrait Tanning had painted early in her career, in which she has depicted herself in an apartment room, half stripped out of a theater costume, staring out at the viewer with a strange winged creature sitting beside her feet, while a hallway of doors are opening and closing in the background. This painting struck me as the final note to end the story cycle on, because it seemed like an image of self-actualization and potential, as opposed to the more cultural conflict and journey-driven paintings of Varo and Carrington. 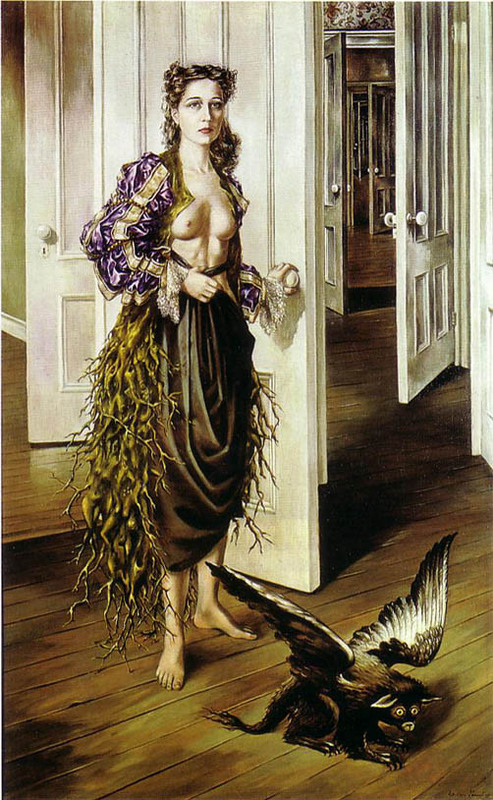 This was a painting that seemed entirely bare-faced in its depiction of the female body within a surrealist self-portrait. There are no masks, no hint-hint, it’s me coded in fantasy metaphor. The woman is undeniably Tanning, but the fantasy of surrealism surrounds her in the form of the magical winged creature and the opening and closing doors in the background. Max Ernst named the painting “Birthday” and Tanning thought it was appropriate. In some ways it feels like a coming-of-age painting, a depiction of a young woman coming into her own and displaying herself unabashedly to a viewer. A debut painting, in some ways. And a celebration of the self. I approached my trans-literation of this painting into story in a similar fashion to the process I went through with Carrington’s “The Guardian of the Egg”: by creating the arc of a story that would lead to this image as its final image. To do this, I needed to imagine who this character in the painting would be. It would not be Tanning herself, because that would have forced me into a biographical sort of recounting of her life and its various hills and valleys, and I’m always less interested in the literal than I am in the metaphorical. So I gave my Birthday girl a different name, Emma, and decided to use the apartment setting of the painting as the nearly entire world that Emma has existed within for her entire life–in childhood, early adulthood, a marriage, childbirth, divorce, reinvention of the self, and a final coming into the self and inhabiting it with ease, as Tanning has depicted herself in the original painting. In a way, the story reads with the feeling of a piece of autobiography. The narrator is reflective as she recounts her trials and tribulations, but unlike a true autobiographical account, the events of my fictional Emma are quite strange. 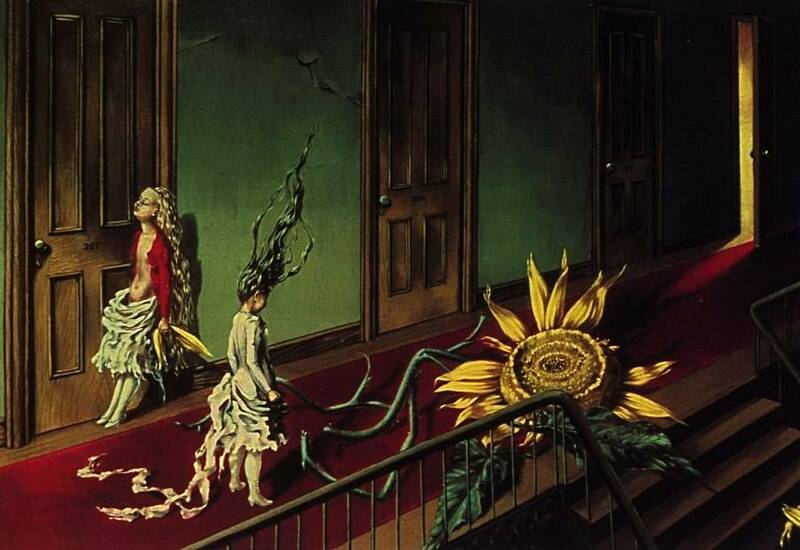 She discovers a secret room, for instance, where the winged creature in the painting has lived for years among the denizens of the apartment building without anyone realizing. This was perhaps the most fun of the three stories to write. Even now, as I’ve searched out images online to include in this post, I’ve felt like I’d like to do more stories inspired by these artists (and perhaps a few other artists I’ve encountered in the years since I completed these stories). Tanning’s “Eine Kleine Nachtmusik” always spooks me when I look at it, for example. Who knows? Maybe I will. I’m usually the last person to know what I’ll write next. Thanks for reading about these painters, these paintings, and the stories I wrote from them. I hope you enjoy the book!